oh my, i almost missed my own can jam selection month! it seems that fall is almost everyone’s favorite time of year by the response to the november selection of fall only type fruits like apple, pear, and quinces. it’s mine, too. this is a lovely, delicate and floral preserve that i hope you enjoy. equally nice with a nice triple cream brie, walnuts, and crusty french bread or your morning toast. peel and core pears. chop into small dice and place in large bowl with lemon juice, turning and covering pears with juice as you cut. add sugar and mix. cover and place in fridge overnight. 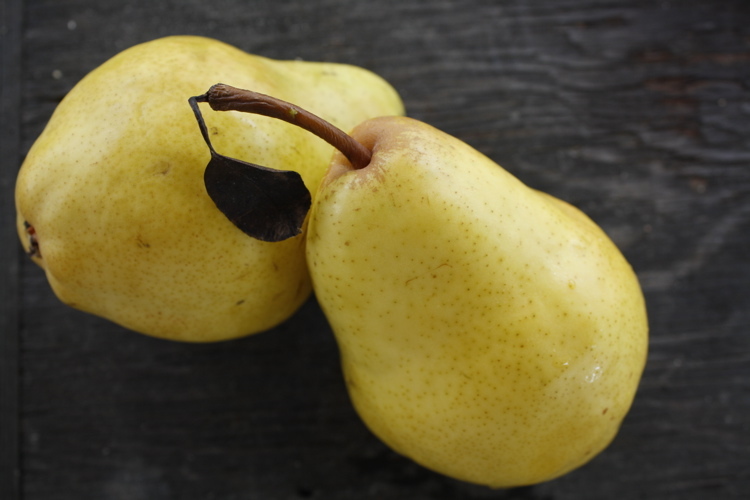 place in large pot and simmer for about 20-25 until pears are almost translucent. puree with an immersion blender until a small amount of pear pieces remain. simmer for about 15 minutes until thickened. remove from heat. add honey, vinegar, and sage. taste after 2 minutes to test sage infusion – and every minute thereafter until desired level of flavor is reached. be careful, it can get strong quickly. process for 10 minutes in a water bath. at last glimpse, our heroine had just started a preserves company called ‘confituras‘ and she was about to embark on a long, arduous journey that would take her to parts unknown. well, my friends, i am here to tell you about the great beginnings my journey has enjoyed. firstly, my time at the farmer’s market has exceeded expectations so much so that i am pinching myself weekly. it has been a near sell-out every week. and, beginning in a few weeks, i will start at the triangle farmer’s market on wednesday afternoons. secondly, the food community here in austin has been supportive in ways that i would have never imagined, both in coming to buy my confituras at the market and encouraging other like-minded folks to do the same, and in the press i have received thus far: first this lovely blog, then this one, then this other one. then edible austin got a piece of me, then our local newspaper. holy smokes, people! you sure know how to make a girl blush! and lastly-my friends and family, many of whom have been long-standing guinea pigs testers and tasters, volunteers, web designers, label makers, sous chefs and the best cheerleaders a girl could have. and now on to more interesting things. 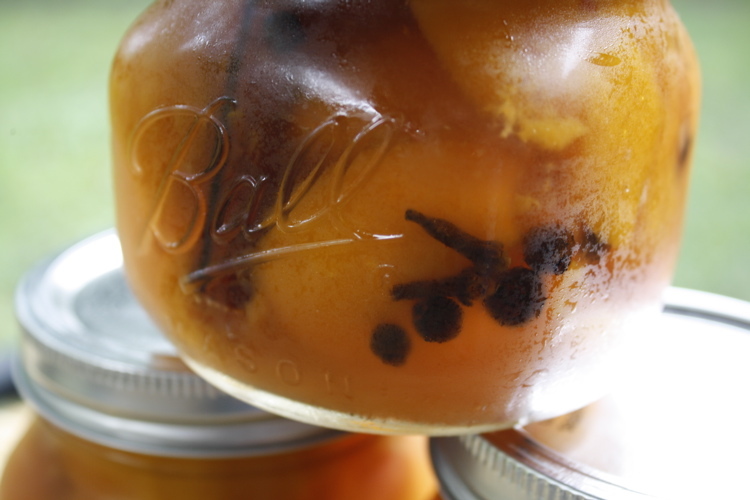 i first saw this recipe for pickled peaches in the texas monthly in october of last year. ‘texas, our texas’ peaches may be small, but flavor trumps size and fredericksburg offers some good ‘uns. i have waiting patiently for almost a full year to make it. and although i have to admit that i have sneaked some from the jar, the hardest part is happening now: i am awaiting the marriage of flavors that occurs in a jar full of fruit, vinegar, sugar, ginger, allspice, cloves, and cinnamon. and i will wait until thanksgiving. this is southern tradition, folks. 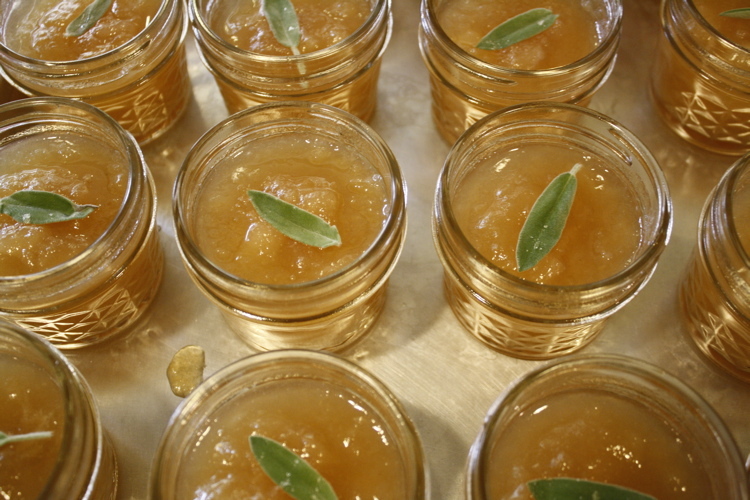 the preserving happens at the peak of peach season. the enjoyment happens at a special place at the most special time of the year~the holiday table. it is also tradition to stud the peaches and preserve them whole but i decided on doing it my own way-a more conservative half peach swimming amidst it’s warm holiday spice soak. place vinegar, sugar and spices in a large stock pot. heat until simmering to dissolve sugar. add peach halves, bring back to a boil, reduce heat and simmer for 3-5 minutes. turn off heat, cover and allow to stand overnight where the peaches will plump up and say howdy. 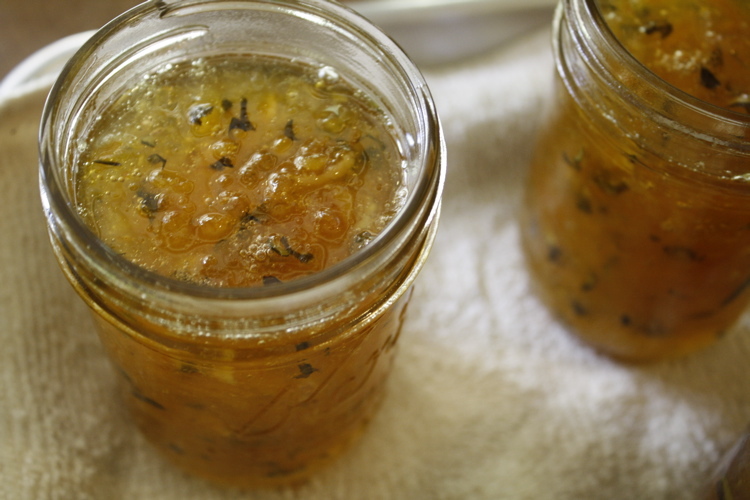 sterilize jars and prepare canner and lids while you heat this mixture back up to the boiling point. 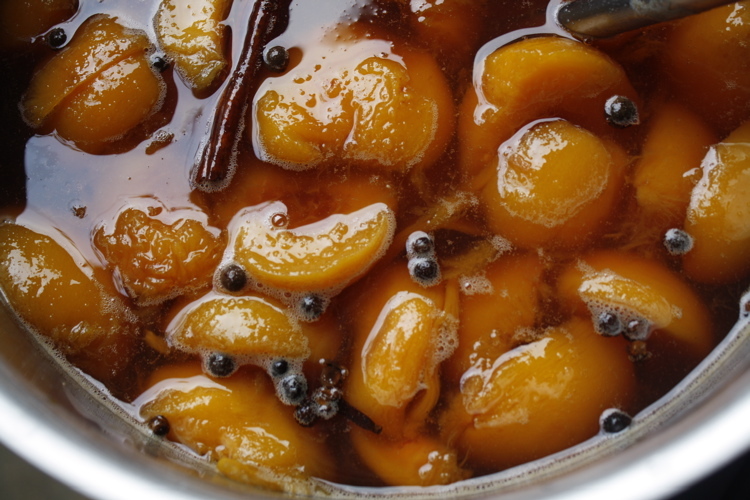 add 5 or so whole cloves and whole allspice and hot peaches to hot jars. add 1 cinnamon stick to each jar and top with syrup and adjust for 1/2 ” headspace, removing any air bubbles as you go. process for 20 minutes in a hot water bath. wait until thanksgiving or christmas dinner to enjoy them! so the main reason i wanted to participate in this year-long canning challenge was to learn a few things not only about canning, jamming, pickling, etc. but also about the personality and behavior of the actors (aka produce) going into the jars. i have gardened for about fifteen years and some of these plant genera are still foreign to me. for instance, i had never heard the term ‘cucurbits’ in my life, although most in this family of plants are very familiar to me and i’m sure to you as well: summer and winter squash, cucumbers, gourds, and a whole mess of melons. this month’s challenge was to get one of these preserved in jars. i knew immediately what i needed to do when this category was announced: correct that bad feeling i had when i made cucumber pickles last year. they were disgusting. i swore that i would remedy that when the opportunity arose the following summer. but when i went to the market looking for pickling cucumbers, wouldn’t you know it, there were none to be found. so in the meantime, my dearest friend, kathy, gifted me with what she referred to as a ‘steroidal zucchini’ from a garden she had been caring for earlier in the day (along with almost 10 pounds of figs–i know i choose my company well). she wasn’t kidding–look at this thing! 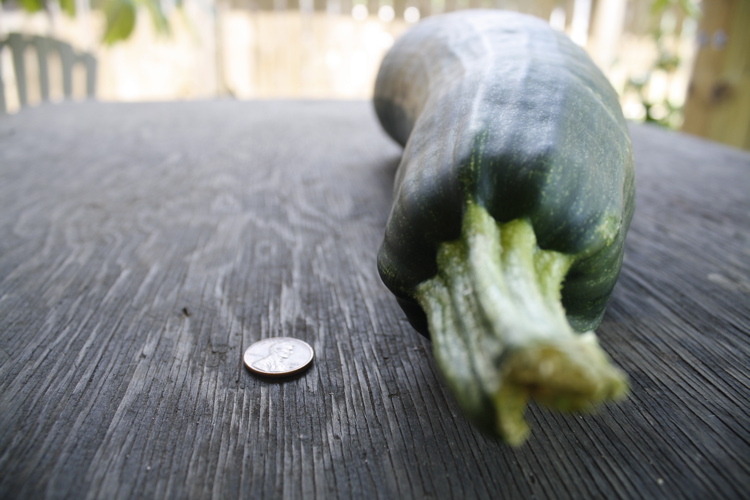 it’s not the type of zucchini that tastes good in just a simple saute. 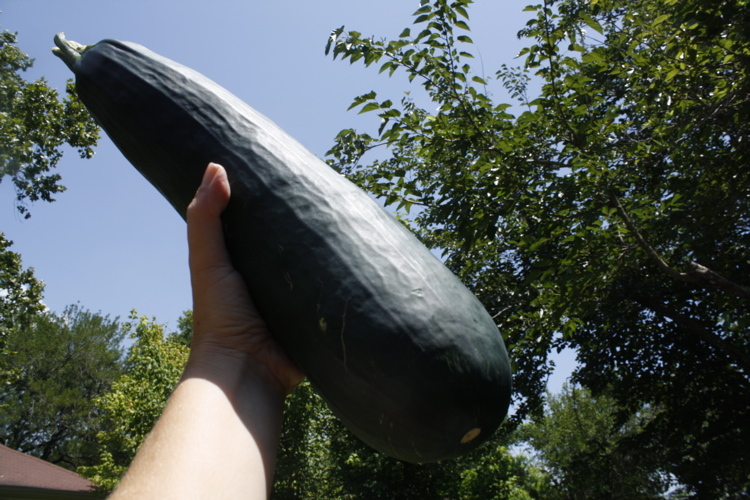 this motha needed to be baked in a bread or….made into zucchini marmalade! ever since i came across the idea of making marmalade out of zucchini, i have been intrigued. the resulting concoction is a bright, sunny citrus spread with, yes the color of zucchini flecks but also the nutritional whallop of the squash. i used a full two-thirds of this in the double-batch i prepared using the recipe below. i feel healthier already. 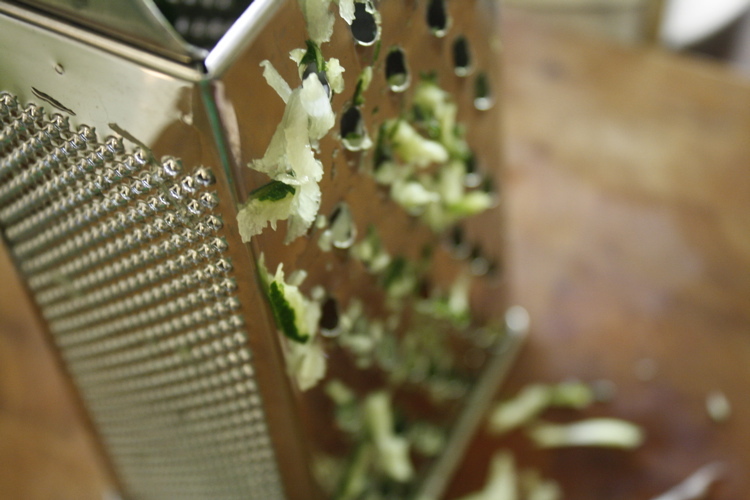 wash lemons and orange well and grate using the largest holes on a box grater. place in a large pot or preserving pan with the water. peel some of the white pith from the lemons into large pieces and place in in the same pan (you will be removing these later, so size matters as you will have to fish them out). simmer for about 30 minutes. meanwhile, finely chop the flesh of the lemons and oranges (after removing any remaining pith and all seeds). remove the pith from the pot and add in the lemon and orange flesh and the grated zucchini. bring back up to a simmer and allow to slowly cook for about 20 more minutes. add in sugar and bring to a boil, taking care to monitor that the mixture doesn’t foam up and boil over. boil gently, stirring often so it doesn’t stick to the pan, about 30 minutes. check temp with a candy thermometer or, my preferred method is the wrinkle test to test for gel set. 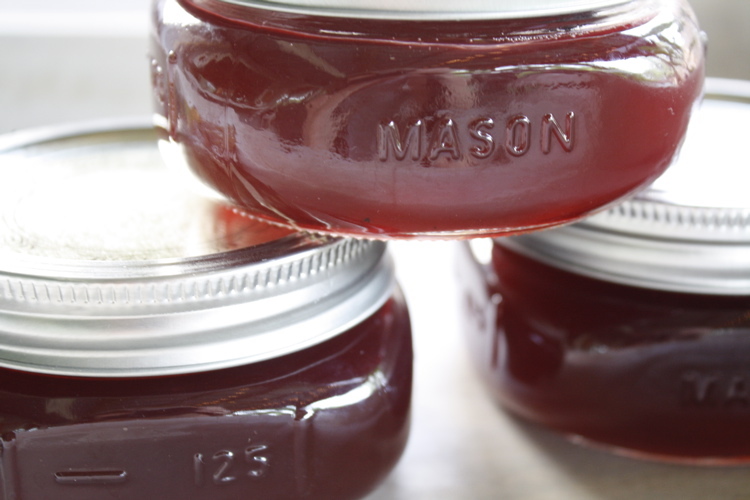 ladle into prepared jars and process in a water bath for 10 minutes. another month, another canning challenge. this is my second attempt at jelly-making and my first with pomona pectin. i am in love. talk about product performance-what a concept: this stuff delivers on it’s promise, which is to gel or set your mixture and not to add preservatives, additives or unneeded extra sweeteners. 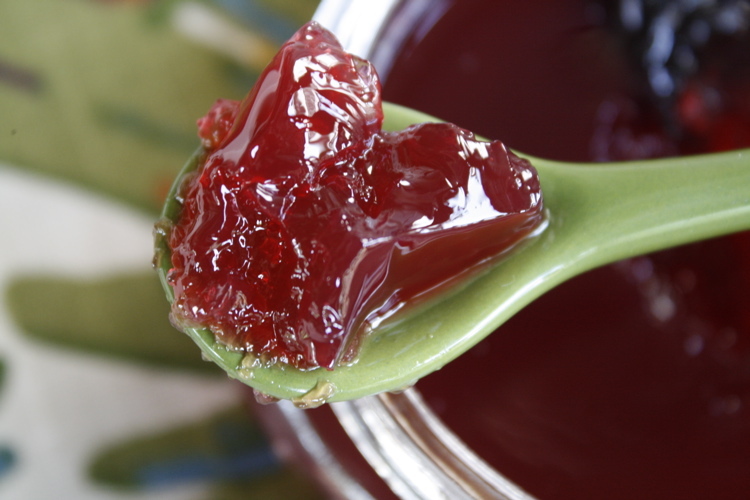 now, on to the jelly itself. this month’s challenge provided a choice between asparagus or rhubarb. since my last two canning choices were more of the savory variety, i decided on rhubarb. now, i don’t what your experience with rhubarb is, but mine is nil. nada. nuttin’ doin’. never touch the stuff. actually, it kind of freaks me out. i mean, check out this creepy picture and tell me you won’t have haunting dreams tonight. i knew enough about it not to touch it while i was chopping it up; it stains everything it touches. being a nurse is handy as there are always a box of gloves hangin’ around for duties like this. as i was making pictures of it, i softened a bit toward it’s rugged good looks. the deep color and striations and such started to grow on me. i read sweet stories on the internets about fond memories of grandma handing her little ones raw rhubarb stalks dipped in sugar as a special springtime treat. all manner of people were baking it in pies and cobbler, stewing it to serve in a fool or with some delicious grilled or roasted meat product. these people must have known what they were doing, right? and no one was poisoned, once they figured out not to eat the leaves, right? right. i followed pomona’s instructions for fruit ratio, pectin amounts, and the like. the flavor profile is way more hibiscus than rhubarb, most likely due to the fact that i did not get a whole lotta juice from those stingy stalks. 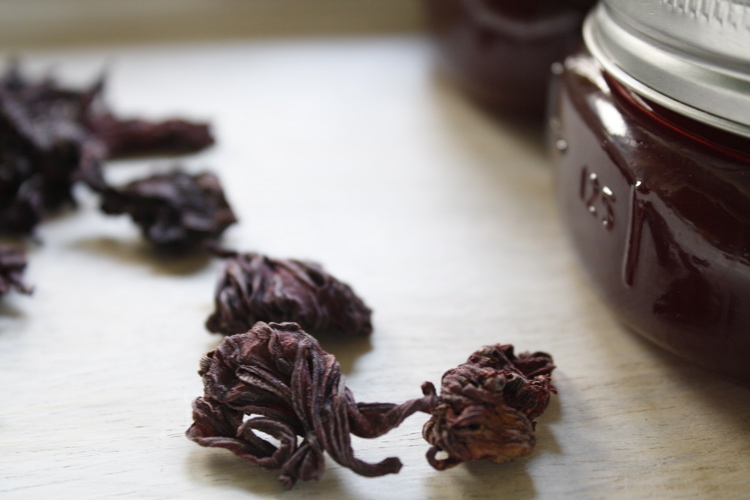 i had to supplement much more with steeped hibiscus than i had initially planned. this beauty will most likely end up on my next cheese tray. 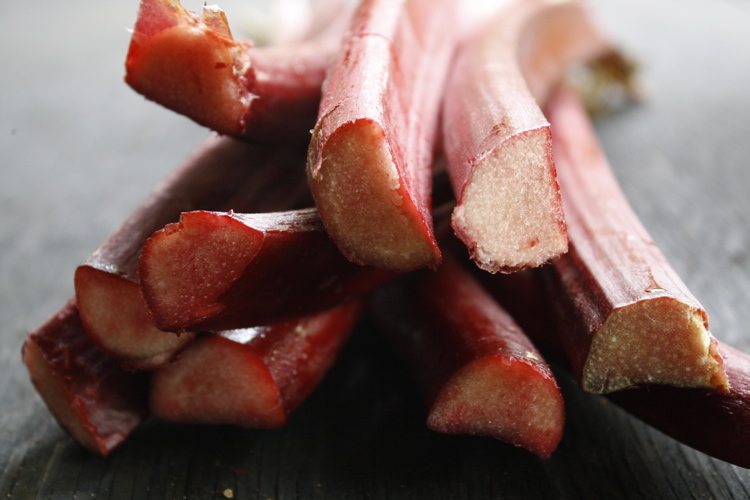 clean and chop rhubarb into 1/2 inch chunks, discarding any browned or leafy portions. (yes folks, the leaves are poisonous). place in a large pot with a cup or two of water and simmer until softened. add a large handful of hibiscus flowers during the last minute or so of cooking. the longer they steep, the darker the jelly will be. at this point, i whirled the mixture in the food processor but i wish i hadn’t. it became almost too thick to strain and i only got about a cup and a half of liquid through it. strain through multiple dampened layers of cheesecloth for at least 2 hours and up to 24 hours.resist the temptation to press on or push the liquid out. rumor has it that this will cause the jelly to become cloudy because, inevitably, some solids will end up getting through as well. measure the amount of liquid strained and bring an amount of water that would bring this to a total 5 cups. for example: my 1 1/2 cups of strained juice had me bringing 3 1/2 cups of water to a boil. 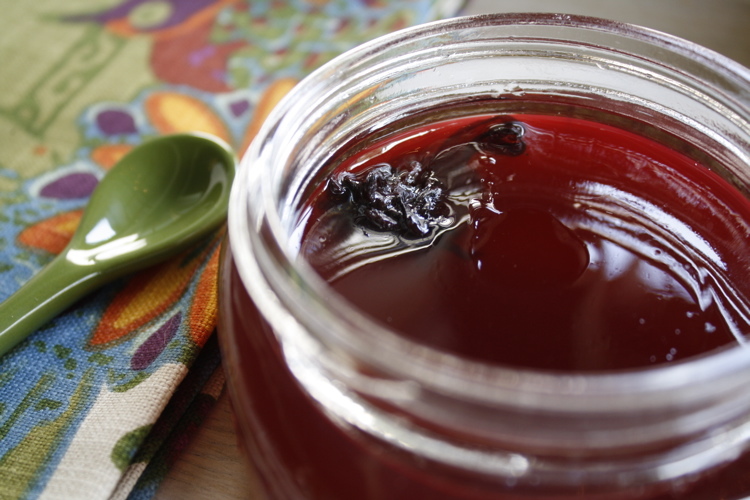 add another large handful of hibiscus flowers to the boiling water for just about 30 seconds or so and strain through another few layers of cheesecloth. add this hot liquid to your juice. rinse out your pot, add the liquid, lime juice, and calcium water and bring to a boil. measure out your sugar into a bowl and add the pomona pectin, stirring well to combine. add the sugar and pectin to the boiling mixture all at once and stir for a minute or two until the pectin is well dissolved. bring mixture back to a boil and add additional sweetener if desired. if i had it to do all over again, i would have added some honey at this point to round out the sweetness. ladle into sterilized jars and process in a hot water bath for 10 minutes. i floated a few flowers on top but most did not stay cenetered. i am ok with this. ok, so while most of you are getting out your sweaters and jackets, here in texas we are simply pretending it’s fall. we finally got a break from the 100 degree days this week, and by the looks of it, you’d think 95 was the most refreshing temperature imaginable. it’s all relative, I suppose. this is all to let you know that while you may no longer be in the mood for chilled soup, we are still right smack dab in the middle of enjoying such things. place blade on bowl of food processor. with processor running, add nuts and garlic until finely minced. then add grapes, grape juice, water, and cubed bread and puree until smooth. strain mixture into a bowl through a fine sieve. chill for at least 3-4 hours. meanwhile whip heavy cream in a bowl until soft peaks form. fold into grape mixture gently. garnish with sliced reserved grapes and drizzle with walnut oil. this summer i’m participating in summer fest 2009, wherein culinary ideas and inspiration about summer produce are traded by a group of food lovers and bloggers. a group, you say? but she never joins ‘groups’. i think she hates groups, in fact! yes, i have a rep. i come from a long line of non group-joiners. what that is, i don’t know. it’s like a bad habit. i’m trying to be more aware of some of my not-so-good habits, diversify, break out of the same old rut, say yes when i would reflexively say no. always a good thing, ya know, to stretch those rigid muscles? anyway, if you’re so inclined, you should check out some of the blogs from these summer fest party hosts: mattbites, steamy kitchen, white on rice couple, and a way to garden. i found distributing the crust evenly in the pan to be very zen-like. it sort of reminded me of sandcastle-building. i did my best to keep the filling-eating within normal limits. i was not successful. somehow i still had enough to fill the tart pan so no one would know. mascarpone cheese is like an italian cream cheese, but it is extremely luxurious. it is a little pricey,but since the whole dessert is not very expensive to make, resist the urge to use all cream cheese. there is some chilling time needed, so plan accordingly. we ate the leftovers the next day, and it still appeared and tasted very fresh. preheat oven to 350. process gingersnaps in a food processor into a fine grind. add melted butter and pulse until combined. press mixture into botton and sides of a 9 inch tart pan with a removable bottom. bake crust until darkens, about 8 minutes. set aside and cool completely. beat all ingredients for filling, except crystallized ginger , in a medium bowl or stand mixer until smooth. add ginger, if using, and mix with a spoon. spread gently into prepared crust. cover loosely and refrigerate at least 2 hours or up to 1 day. 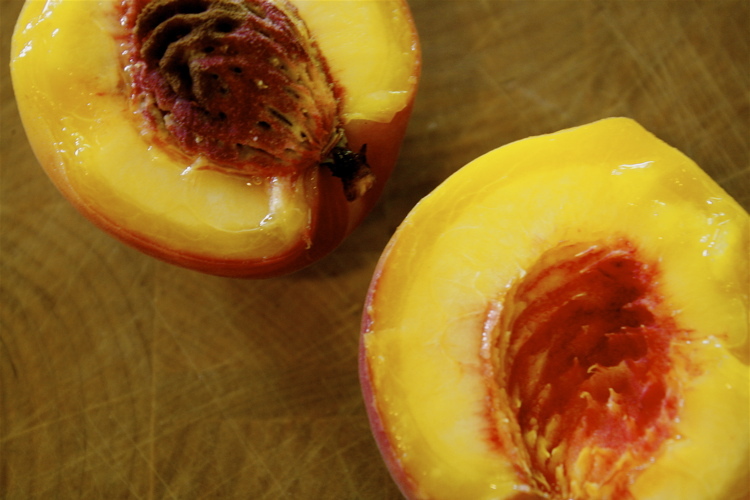 after chilling, arrange nectarine slices in an overlapping pattern on top of filling. brush with jam. sprinkle with chopped crystallized ginger. serve, or refrigerate up to 6 hours. next time i think i’ll leave off the jam glaze. it doesn’t need it. it was perfect with just the clean and fresh taste of the fruit alone (see below). this would be perfect with plums, figs, or even fresh berries. life has officially gotten in the way of my blog and i am thoroughly dissapointed by it. i swore it would never happen to ME. first, we had a new addition to the family (our niece was born on june 2nd) so an unexpected trip happened, then i got sick (VERY sick for 3-4 days plus the rest of the week to recover), and finally we had to plan and hold the 5th annual ribapalooza, which is a huge rib-cooking contest we hold at our house every 4th of july. so needeless to say, posting has had to take a back seat. it happens to the best of us, i guess. i meant to post this recipe yesterday, in case any of you wanted to celebrate america’s birthday by making and consuming sangria, but it just didn’t happen. and really, this is something that you will be making all summer long, anyhow. so i figure, no harm, no foul, right? honestly, making sangria is more art than science. and, fortunately for you, there is a lot of tasting going on when making this. and it is absolutely NEVER the same same twice. it’s kind of exciting how fleeting it is. this time around i used vinho verde, which is a young, very light (in flavor and alcohol content), slightly effervescent wine from portugal. it is available in white or rose. it is often VERY inexpensive and i think it’s nice because of the low alcohol content, especially when drinking outside during the heat of the day. i attribute the fact that i am not the least bit hung over today after consuming 2 or 3 4 or 5 glasses of this over the course of several hours to this fact. put your prepared fruit in a vessel large enough to accommodate all of your liquid. add wine and refrigerate several hours or overnight. (i reserved a few of the bottles and added them just before serving to preserve some of the effervescence). just before serving, add the rest of your wine and your fruit juices and/or soda. i place the vat of sangria with cups and plenty of ice on the side for people to serve themselves. it is dangerously good. *taste as you go for your preferred level of sweetness. you could even make a simple syrup (1 part water to 1 part sugar-simmer for a few minutes to dissolve sugar and chill). also, dark sodas (coke or dr. pepper) would really not work here.